If you read my bio, you’ll see that I started painting in 2010. I took art, wood shop and metal shop in high school and loved them, but being a hippy and a teenager got in the way. My mother would buy me paint by numbers up until I left home, did every one of them. But, I never tried to draw or paint anything on my own. Then January, 2010 happened and my life changed. The 4 examples across the painting above are 4 that I did within the first 6 months of 2010. My aunt has owns the first 2 on the left, the next one my neighbor owns and I still have the last one. It’s framed in in my studio. I sell cards and prints of it…one of the most popular actually. Anyway, you can see the style, as well as lack of knowing what I was doing. I just knew I wanted to do it. With Artists, Does Practice Make Perfect or Does It Comes Naturally? I think there are artists out there that naturally have the gift, Brad Noble and Martin Wittfooth being two that I follow. Me, personally? I do not have the natural talent. And, I think you can see from the picture above that practice, practice, practice has helped me to improve. The picture across the top is a more recent one and it won an Honorable Mention Award. Do Artists Need to Take Classes to Improve? I don’t know about other artists. I do know that they help me. I took one a few months ago on Color Theory that was so eye opening. I can now mix my own colors (not paint, just colors) to get the one I want. Don’t have to run to the store to buy 100’s of tubes of paint. I took private lessons from Brad Noble off and one for a couple of years. Not only is he pretty to look at, but he’s talent is over the top. I was very lucky! Martin Wittfooth, an artist I really hope to meet one day, did an online class. I think I’ve watched it maybe 5 times and will probably watch again. 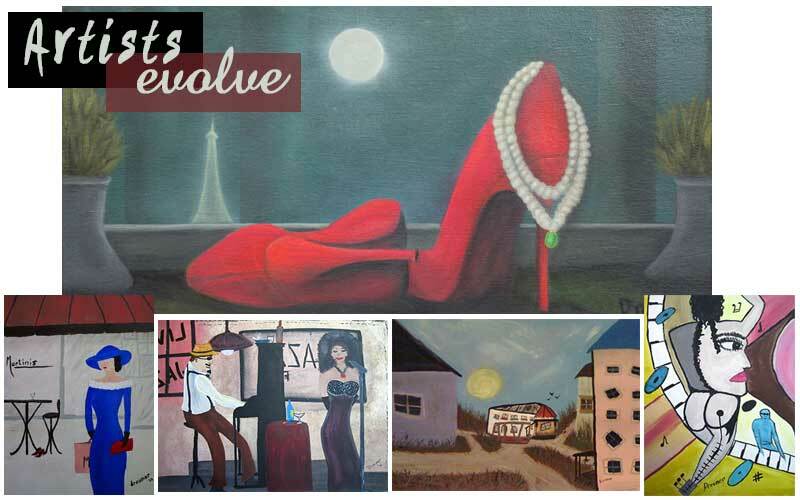 The recent painting in the above picture (red shoes with pearls) follows Martin’s style and Brad helped me finish. I’m signed up for another class in a few weeks for Composition. Stay tuned to see how much more I evolve after doing that class.